“Wholesum has been a total game-changer for us! Have feedback you like to share with us (or the world!)? Don’t hesitate to reach out. We’re always happy to hear how Wholesum has impacted your organization and (on the flip side) are always looking for ways to improve the platform. We couldn’t have done it without users like you! Our customers come from many industries. If you’re regularly planning menus for large groups of people, Wholesum could be just what you’re looking for, whether you’re an outfitter, a caterer, an educator, or another professional in charge of providing meals. We’ll take some time over the next few months to look a bit further into these industries, and how Wholesum is helping customers in these fields plan menus, navigate dietary restrictions, scale meals track costs, develop accurate shopping lists and so much more. This May, let’s start with outfitters! We’re excited to feed people delicious meals that enhance their outdoor experience, but – in most cases – we have other things to take care of, too. For many outfitters though, it can be a real headache. There is a surprising amount of complexity that can go into planning a menu for a trip: group size, trip duration, ingredient quantities and – increasingly – dietary restrictions. Here’s how Erik Weiseth of Orange Torpedo Trips put it: “For years we did all of our menu planning in Excel spreadsheets. When planning meals for groups, whether in the back or front country, make sure you consider how you’ll be storing food at night and what your refrigeration/ice situation is – health and safety are key. Remember, appetite size can vary! Metabolic rate skyrockets in cold temperature, so make sure to plan for large appetites if you are expecting chilly conditions. Age, weight, gender, and level of activity can also cause real fluctuations in the amount of food you may need to pack. Keep in mind what device(s) you’ll be cooking with, the length of your trip, how you’ll be carrying your weight (raft, backpack, canoe + portage, van, etc. ), and your level of exertion. These aspects of your trip will dictate what kind of food (fresh, frozen, dehydrated, etc.) you should bring, how light it must be, how many calories you and your fellow campers should consume, and how you’ll want to pack those meals. Take stock of who you’ll be traveling with, including their age, level of fitness, and dietary restrictions, as these facets may also influence portion size and alternative ingredients. Have fun! Pack something special, something sweet, and/or something spicy. It’s a fantastic surprise to have steak the first night or chocolate after a long twelfth day! Every meal is a little bit better when eaten under the stars. Three years ago, when we had exhausted all other technology options for menu-based planning, we started developing Wholesum Food Calculator (www.whlsum.com) to help others streamline food planning. Wholesum is the only menu planning tool designed specifically for large groups and/or multi-day trips. It’s a cloud-based platform, and has a suite of functions available based on feedback we’ve received from users including substitutions for dietary restrictions, easy scaling, and detailed shopping and packing list options. At the end of the day, we hope that – like us – some of these tips and tools can help make menu planning easier and more enjoyable for years to come! Want to bring the right number of gluten-free bagels instead of regular bagels whenever you have gluten sensitivity in your group? Wholesum can automatically plan for you! Head over to your “Profile” Page and turn on Ingredient Substitution. Need a primer on how to get it all set up? We’ve got a video for that. All you’ll need to do is define which ingredients need substitutes! 2. SMART PHONE SHOPPING LISTS! Everyone knows that you can export your shopping lists to PDF or Excel, right? But did you know that you can use your iPhone or Android Smartphone to view your shopping lists? Create your meal plan online and then view your lists synced between any device. 3. COMBINE LISTS & SHOP FOR MULTIPLE GROUPS! Is Wholesum right for you? There are a number of meal planning apps out there – some for individuals, some for families, some for potlucks, some for bakers. So what sets Wholesum apart? Wholesum is specifically designed to take the complexity out of meal planning for groups. Are you feeding meals to more than a few people regularly? Do you have to plan around dietary restrictions? Do you host multi-day trips or large events? Do you have your own recipes you want to use, but could use help scaling up and down based on group size and number of meals served? Then Wholesum might be right for you! Can you believe it, over 100,000 meals served already in 2017?! That sizable number is a testament to all of the great, hardworking people who have found that Wholesum Food Calculator saves them the headache, time, and money that too often goes into meal and menu planning for groups. You have other things to focus on – whether it’s planning trip logistics, a program curriculum, or prepping gear – this does not have to be one of them! With a growing number of customers who find that Wholesum is a time and money saving game-changer, we’re so happy to help. Wholesum helps users plan menus around dietary restrictions, group size, and so much more, and then streamlines the process of shopping for ingredients, and cooking great meals. We’re pleased to see the real-world value of Wholesum for staff members across the spectrum of specialties – from river guides to event planners to wildnerness adventurers – is filling bellies out in the great wide world of forests, rivers, mountains, and everything in between. One of the most frequently-requested features that we hear from users is to automate some of the substitution of ingredients when dietary restrictions are present. Well – I’m happy to say that the feature has been recently added! Define your substitutes: On your recipe pages you’ll now notice a new column with a substitute symbol. By clicking on that symbol, you’ll be able to define a substitute if the ingredient contains a common dietary restriction. 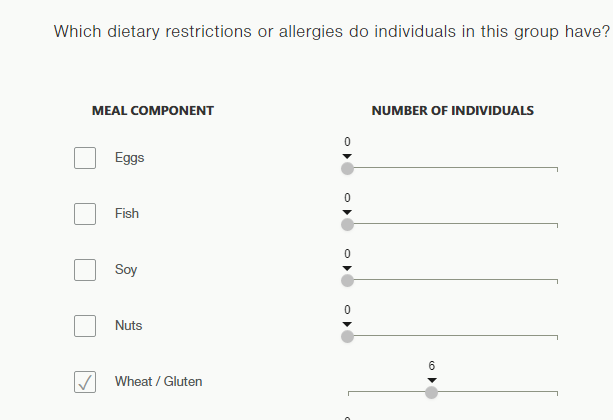 Number of Dietary Restrictions: You’ll also notice, now, that instead of just checking off which dietary restrictions are present in a group, you’ll define the actual number of individuals with that dietary restriction. These two adjustments in combination make a powerful tool: Wholesum will apply your substitute proportionally based on the total number of individuals with a conflicting restriction. Take it for a spin! You can turn it off at any point by heading back to “My Profile” and switching it off. We look forward to hearing what you think! Thanks for your on-going ideas for new tools and features. One of the key benefits of using Wholesum is that we take care of the complicated math behind your multi-meal, multi-day trips and provide you with a complete shopping list, summarizing and organizing your recipes’ total ingredients – by store and department, if you like. Although many people prefer printing out a hard copy list (and can do so in an editable Excel spreadsheet or PDF format), another camp of our customers like the ease of keeping track of what they’ve picked up and what they still need to purchase on their phone. It is for those users that we’re excited to announce the release of our iPhone and Android Wholesum mobile apps! Your mobile shopping list will be synced between devices. Make edits on your laptop, and they’ll immediately be reflected on your phone. Perhaps you are shopping at one store on your phone while your coworker is at another on their phone. Just make sure you check off what you’ve picked up, refresh your app by pulling down on your meal plan page, and everyone’s lists will be in sync! Given the detailed nature of menu planning and recipe creation, these apps focus entirely on the shopping lists that you create. So make sure you develop your recipes and meal plans on your computer, and then when it comes time to shop, you’ll have a responsive mobile option in your pocket! Apps run on iPhone and Android products. Group meal planning made simple – and now, on the go! How much can Wholesum save you? What kind of “calculator” tool would we be if we didn’t help you calculate your potential savings from using Wholesum. We developed this nifty calculator to help you see if Wholesum is a good financial fit for your organization and how much you stand to save by signing up. We’re always working to improve our web-based tools to simplify your group meal planning. 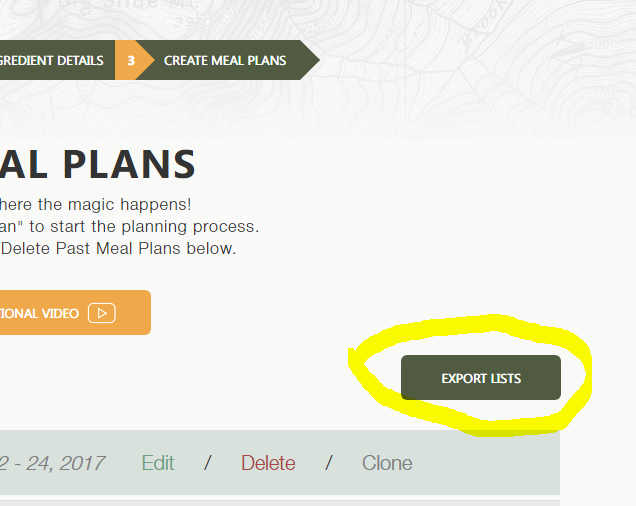 With your feedback in mind, we have added additional options to make your meal planning and shopping easier, so you can focus more of your time on other areas of your work. 1. Import Any Recipe from Allrecipes.com! Creating your recipe list just got a whole lot easier. 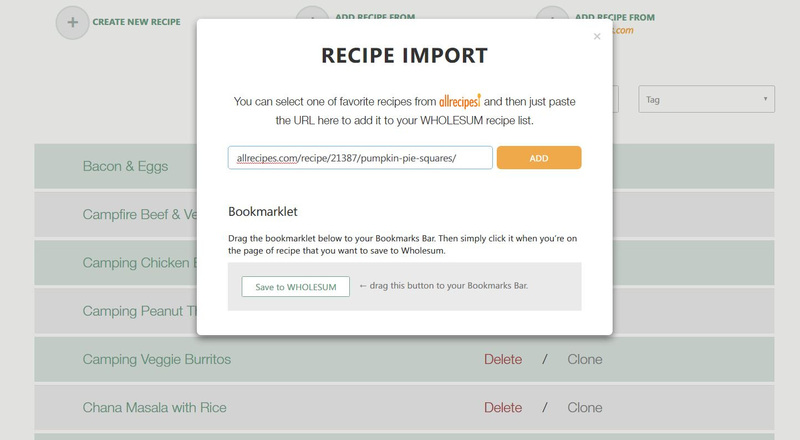 Now, instead of just creating your own custom recipes manually or importing them from the Wholesum Cookbook, now you can add any of the thousands of recipes on allrecipes.com. Just click “Add from allrecipes.com“, paste the URL of the recipe, and you’re done! Many of you mentioned that your meal planning wasn’t just about meals and ingredients, but also about dates and scheduling. We heard you loud and clear. Now, schedule all of your meals using a calendar and meal grid to schedule each meal served each day throughout the duration of your group plan. We hope these updates will prove valuable to you. Our goal is for you to spend less time on meal planning, so you can spend more time focusing on your expertise! This one comes to us from Outside Magazine via NOLS instructor Casey Pikla. He’s also one of the hosts of the ever-popular NOLS Cooking Show’s YouTube channel. Mix peanut butter, butter, sugar and any optional ingredients together until well combined. Roll out dollops of the peanut butter mixture into one-inch oblongs; set aside. At home, cube bread and mix with melted butter or coconut oil, raisins, spices, salt and sugar. Meanwhile, add milk powder to 1 cup treated water in a sealable, boilable container or freezer bag and shake well to blend. Add bourbon and egg powder to milk and continue to mix until well blended, then stir into bread mixture. Measure and mix dry ingredients (powdered milk, cocoa powder, sugar and salt). Put pre-measured dry ingredients into your pot with water and peanut butter. Bring to a boil; boil for 1 minute, stirring constantly. Turn off stove. Immediately add quick oats and pecan pieces. Blend well. Spoon rounded teaspoons of dough onto a spare plate or any other flat surface. Allow to cool for 5 to 10 minutes. The easiest of them all. An orange peel cupcake recipe brought to you by Eureka Tents. This one can be prepared at home and only takes a few minutes in the backcountry.